Hell was born Richard Meyers in Lexington, Kentucky, in 1949. The book, I Dreamed I Was a Very Clean Tramp (HarperCollins, 2013), starts with his childhood and moves to New York and his work as a poet and musician with bands like the Neon Boys, Television, the Heartbreakers and the Voidoids. Hell also read other passages about playing at the legendary rock club CBGB and working with musicians like the late Peter Laughner, Robert Quine and critic Lester Bangs. 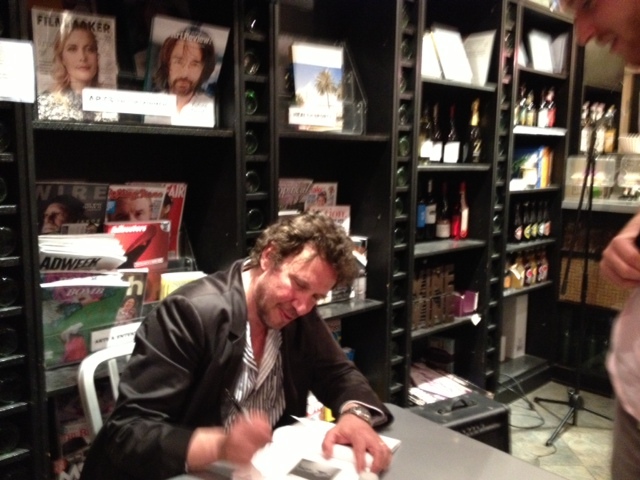 After the readings, he answered questions about his music, his influences and other musicians he knew and worked with. Hell created the punk look of spiky hair, safety pins and shredded shirts, which will be represented in the exhibit of punk garments and punk-influenced couture at the Metropolitan Museum of Art in New York, opening May 9. The exhibit includes a re-creation of the famous toilet at CBGB. http://www.metmuseum.org/exhibitions/listings/2013/punk About the punk look, Hell said, “We just wanted to be noticed” and “I tried to figure out how I could make myself look the way I felt.” He wrote the preface for the exhibition catalog. Hell was also the creator of the famous t-shirt displaying a target and the words “Please Kill Me” stenciled on the front. The shirt may have been worn only once by another member of the band Television. Replicas of that shirt can now be found on several internet sites. 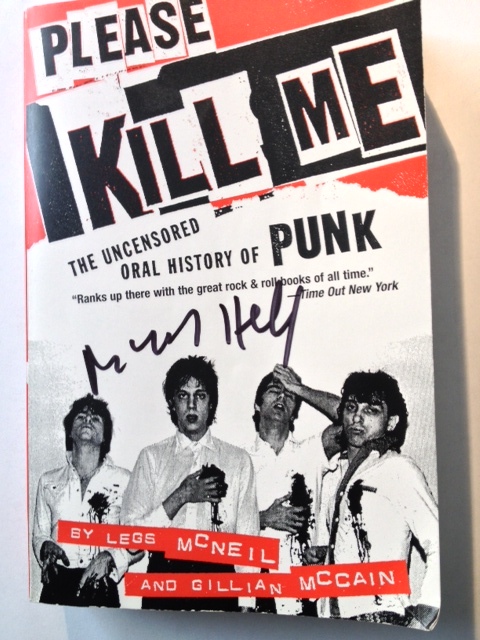 Hell signed copies of books and he also signed my own copy of Please Kill Me: The Uncensored Oral History of Punk (Grove Press, 1996). Hell is pictured on the front cover, second from left. And for the person ahead of me, he signed the jacket of a pristine vinyl copy of the Voidoids’ 1977 album Blank Generation, which features a photo of Hell, shirtless, with the words “You make me _______” written across his chest. Please Kill Me by Legs McNeil and Gillian McCain is a very good overview of the people, bands, trends and events in US and UK punk rock, starting with the Velvet Underground in 1965 and Detroit bands like the MC5 and Iggy and the Stooges. Hell commented, in answer to a question, that there are a lot of errors in the book. Personally, I think it’s more the Rashomon effect: the book is made up of quotations and perceptions from dozens of musicians, producers, roadies and hangers-on – each from his or her own point of view. If you were there, you would surely find some of those perceptions to be factually incorrect. Punk has been defined as “making up life for yourself.” (That’s usually credited to Legs McNeil.) It’s a sort of all-American attitude that allows for reinvention of the self. A teenaged Richard Meyers moved from Lexington, Kentucky, to Manhattan, wrote poetry, turned himself into Richard Hell, became a punk rock and fashion icon, wrote successful songs such as “Blank Generation,” then dropped out of music, left the drug culture, and became a successful writer. And it’s great to see you writing on Gapers Block! I covered the White Sox for the site during the 2005 season as part of its then-nascent sports section, when I was also doing unpaid rock criticism for the defunct neumu.net…. Oh, I’m so sorry I missed Legs McNeil. I didn’t see that event on the calendars I check. Yes, I’ll be a Gapers Block contributor, mostly writing for the A/C section — I’m reviewing two plays for GB this weekend and I’ll probably repost those later on my site. Ƭake care! Where are your contact details though? Thanks for visiting. Contact info is on the About page.